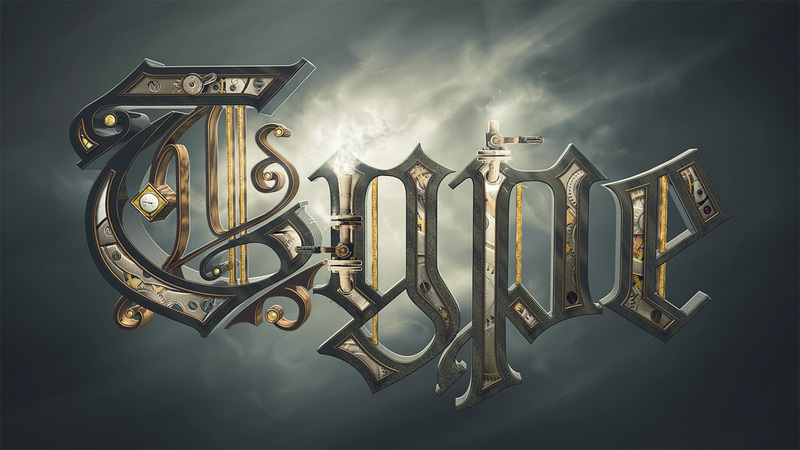 We're back with the second half of our Steampunk style type experiment! In this Part II, we'll generate realistic textures and create a fitting scene for our text. Let's get right to it! Time to get all wound up! Start up C4D and open the scene you created in Part I. First we're going to use a few free materials from the web. You're going to have to register to be able to grab these, but it's free and totally worth it! The first one is a brushed metal material. After you download it, open it. You'll have an empty scene and you can find it inside the Materials Menu. While having the mouse pointer over it, copy it. Paste it into our type scene and double-click on its icon from the Material Menu. Inside the Editor, make a few changes to the following tabs. The first one is Diffuse A. Then change Specular 1 A. Change the Intensity of the Specular 2 A to 20%. From specular 3 A, change the color, size and glare. To apply a material to an object drag it onto one inside the scene, or over a layer from the Objects panel. Place this metal texture over the rest of the word as well. The dots that come from the letter will also have a metal casing. We'll create a different appearance for the rest. It's time for a new material. I know it's strange to modify a wood texture into a bronze surface, but with a few tweaks, it should fool most people. Download this material and place it in the scene. This material comes with a texture, or image. This means that it will have to be linked to this texture the whole time. All you need to do is add a reflection with the same texture, so activate the Reflection tab and find it inside the download folder. Drag it over center loop. Place it over all all the remaining objects of the first letter. And finally, add it over the rest of the word. The final material we're going to use for this scene is gold. Get this material and make one simple change. Switch the Color to black. We want this material to appear only on the front of certain objects. Drag it over the diamond and change the Selection to C1. While C1 is the front face, C2 is the back. You can also use R1 and R2 as selections, but not for this tutorial. Place this material over the following objects. With the type all done, it's time to make a final render. You'll need to bring up the Render Settings (Command + B) and from the General tab, use the settings shown below. Next is Output. Here you can change the render size and aspect ratio. Check the Save Image box and don't forget to specify a path. Also, by clicking on the Alpha Channel, you get to use it to make a quick selection of the content in Photoshop. And finally, change the Antialiasing settings to the ones shown below. You should calibrate these according to what your computer can handle, or how much time you're willing to wait. Hit Shift + R to render it in a new window. This might take a while. Once you have the file saved, open it in Photoshop. Bring up the Channels menu and Command-click on the Alpha 1 icon. This will make a selection of the content. Go back to the Layer Menu, and double-click on the background layer. Give it a name if you like, and press OK. Add a quick mask by clicking on the highlighted icon. We'll now create a different background so create a new layer, and move it underneath the "Type" layer inside the Layers panel. Change the foreground color to #aaaaa9 and background color to #403c3b. Drag a radial gradient with the Gradient Tool from the center out to the top-right corner. Now we're going to create the slots for each letter. Start with the bottom of the first letter. Follow the inner edge of the border and trace a vector shape with the Pen Tool. The color is irrelevant. You'll now need a Small version of this clockwork image. I bet I'll read comments about the gears not being able to physically fit inside the casing, but that's not the point. You can use whatever mechanism image you like. Once you've pasted it over the shape, press Command + T, hold Command and drag each endpoint until it has a skewed appearance. Keep in mind that you have to match the perspective of the letter. Once you've done that, press Enter and Command + Alt + G to make it a clipping mask. Use the Clone Stamp Tool (S) to expand parts of the image that are missing. First of all, make a selection of an even surface (Alt-click), and then paint the top and bottom of the mechanism. Command-click on the layer icon to make a selection of the layer, and go to Select > Modify > Expand. Enlarge the selection by 1 pixel and press OK.
With the active selection, give it a layer mask and make it a clipping mask. Release the clipping mask (Command + Alt + G) now and delete the shape. To give it an extra bit of realism, add an Inner Shadow (Layer > Layer Style > Drop Shadow). The shadow color is #282020. Let's give the image a bit more contrast. Go to Layer > New Adjustment Layer > Curves. After you create a similar curve, press OK and make it a clipping mask. In the same way, create a Hue & Saturation Adjustment Layer with -25 Saturation. Make this a clipping mask as well. And for a final bit of realism, let's add a glass cover. Glass is transparent, but not perfectly transparent. You can also see it's there by glares that appear from light sources, so let's use these two concepts to create a Reflected Gradient (G) with black and white. After you create one on a new layer, Make it a clipping mask. Finally, drag the Opacity to 30%. Repeat the process for the remaining layers. This can take quite a long time, but is great for adding rich detail and making it more realistic. Download this pipe image and cut it out from its background with the Pen Tool (P). I've placed the pipe in a place that fits the perspective of the letter, but not the lighting unfortunately. The darker side of this image is near our light source, so you should normally find a different photo. But this is a tutorial after all, and with the sole purpose of learning, so it will work for now. Next, we're going to make a series of Adjustment Layers to change the appearance of the pipe. The first one is Curves. Change the contrast again with a second Curves Adjustment Layer. The higher contrast has also intensified the colors, so bring down some of the Saturation. Now you'll need a pen tablet to create a few highlights, visible here on black. Once you've painted those on a separate layer, drag the Opacity to 70%. Duplicate the pipe and place it on the top of the third letter. Flip it and erase the top. Another image that we'll use in this tutorial is this gauge photo. Fortunately, the perspective is spot on, so just cut it out of the background. Make it smaller and place it in the center of the diamond. To add a bit of contrast to the background, we'll darken the gradient. Create a new blank layer (Command + Shift + N) and drag the layer opacity to 45%. Now reset the color selection (D) and fill the layer with black (Alt + Backspace). Next with a pen tablet, use the Brush Tool (B) to paint a few soft cloud-like shapes. On a layer above these, create a Gradient Map Adjustment Layer. Use these colors for left (#676767) and right (#e6d7c8). Don't make this a clipping mask. Change the Blending Mode to Overlay. A final stock image that you need is this sky photo. No need to resize it, just move it around until you find a nice stream. Change the Blending Mode to Overlay and Opacity to 70%. Reset your foreground and background colors (D) and create a Gradient Map Adjustment Layer. Press OK and Command + Alt + G.
Create a few more soft glows in the back. Now create a new layer above all the other ones and while keeping track of the light source, add highlights to all the elements. Create yet another layer and draw some steam. Use mostly white, but black too. Here's a close-up of the steam. I've used a pretty large brush size, but you'll also need a small one to add detail. Let's add a light reflection to the entire text. Locate the "Type" layer and add a Bevel and Emboss Layer Style. Now let's make a few color adjustments to the scene. Over the top layer, add a Selective Color Adjustment Layer. Use these settings for Whites and Neutrals. Now add a Channel Mixer and find the Black & White with Orange Filter from the drop-down menu. Press OK, change the Blending Mode to Overlay and Opacity to 35%. And finally, add a Selective Color Adjustment Layer. Find the Blacks and input the values shown below. Believe it or not, we're through with the second half of this tutorial! It's been quite the trip, but three programs later, and this steampunk type is ready to blow off some steam. I hope you've enjoyed reading this tutorial, and managed to complete it without any hiccups! Have a great day!